Scroll down to view the list of Free Meditations included. With access to the Free Meditations Menu, you will also get access to FREE Introductory Sessions for both the Christian Mindfulness and the Christian Contemplation Online Courses. Click on More info for further details on how to subscribe. Christian Mindfulness Meditation includes a variety of self-awareness and God awareness approaches. The aim is to facilitate growth in body, soul and spirit. Each meditation lasts for approximately ten to fifteen minutes and looks at a particular theme. 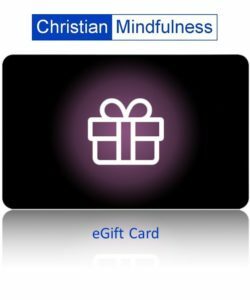 © R H H Johnston Consultancy Ltd.
Give the gift of mindfulness with an eGiftcard!